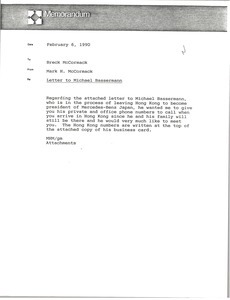 Concerning the attached letter to Michael Bassermann, Mark McCormack gives Breck Bassermann's private and office phone numbers in order to set up a meeting when Breck is in Hong Kong. Attached is a photocopy of Bassermann's business card. 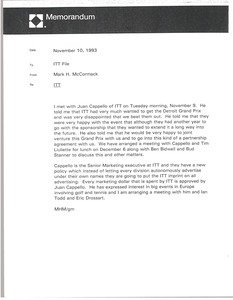 McCormack writes down the details from his meeting with Juan Cappello of ITT Corporation, where they discussed primarily the sponsorship of, and a possible joint venture relating to the Grand Prix. Attached is a photocopy of Cappello's business card.